I have an addiction. This problem has plagued me since high school. I remember one teacher who set me apart from other students because not only did it impact my life, it negatively affected the lives of my fellow pupils. Truth be told, I probably never outgrew it because it has developed into something more. I spend a lot of money on it. I give some of what I buy away, but typically it just sits there until I consume it. I used to share, but not so much anymore. During my freshman year in high school, I read so much and so frequently that my English teacher assigned me a book a report a week rather than trying to force me to sit through the banal lessons of an antiquated text book. He made a deal with me—the cumulative grade I received for my book reports would be the grade I received for the course. But here’s the kicker…if I missed one week’s book report…I failed the class. This wasn’t even a challenge. I had so many book reports finished and stored in my locker, I could have remained a student in the 9th grade for another three years and would still have reports stored away that I could turn in. And this teacher isn’t the only one that noticed the problem. A couple of decades later, I returned to the high school where I graduated, working as a substitute teacher. My Problems in Democracy teacher shared with some of his students that I used to read so much I would hide the book behind my textbook. They would take my books, and I would pull another one out of my bag. This was a serious addiction. They finally just let me read what I wanted because I had already read the textbooks. When I did it that way, I didn’t have to open my locker and let stupid textbooks take up space in my bag. The textbooks I hid my fantasy and science-fiction and thriller books behind? I just grabbed them off the counters when I came into class. I don’t think I ever knew my locker combination my senior year. I read the Lord of the Rings trilogy, starting with the prequel The Hobbit by J.R.R. Tolkien. That started a long love affair with the magical and otherworldly realms of the fantasy genre. I read Here Abide Monsters by Andre Norton, and that got me started down the road on science fiction. 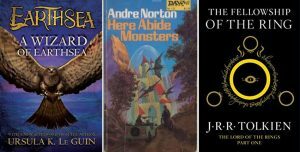 I got lost among the islands of Earthsea when I read the famed trilogy by Ursula K. Le Guin. There seems to be this desire for a sense of wonder in me. For lack of a better word…an addiction. My own personal library consists of over two thousand titles of both fiction and non-fiction now. If you look carefully, you can even find some of my Norton anthologies from my college days while working on my degree in…yep, you guessed it…English. Three of the books and authors that fed my addiction with wonder and excitement…places stepped aside.